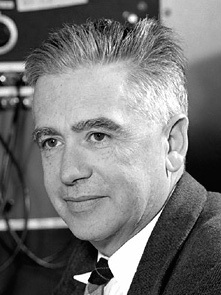 Emilio Segrè was an Italian-American scientist who won the 1959 Nobel Prize in Physics for his contribution to the discovery of antiprotons, a subatomic particle. Earlier in his career, he was an integral member of the Manhattan Project at Los Alamos as head of the P-5 Group, which focused on radioactivity. It was Segrè’s discovery of the high rate of spontaneous fission in plutonium—a discovery that he discusses in this interview—that forced the Project to abandon a plutonium-fueled, gun-type bomb. In this extended discussion, author Richard Rhodes asks Segrè about his close relationship with Enrico Fermi, his decision to return to academia rather than work on a thermonuclear weapon, and his opinion on the storied career of Edward Teller. Richard Rhodes: This will be a tape of an interview with Doctor Segrè. That's E-m-i-l-i-o, S-e-g-r-e at his home in Lafayette, California on the 29th of June 1983. I have been, for example, through the Oppenheimer Papers, I’ve been through the [Leo] Szilard Papers in La Jolla. All of the books, most of the books have errors of one kind or the other. Segrè: The Oppenheimer Papers, I have never gone through, but you have seen the letters of Oppenheimer? Segrè: That's a very [inaudible] thing. From the little that I know, and I don't think that I’m deep in it at the moment, but there is a tremendous amount of double talk on the part of Oppenheimer. He recommends somebody, and then he stabs him in the back. Very often that happens. Rhodes: He was a very difficult personality, that’s clear. Segrè: So, how do you know? You find the letter, but then unless you're very versed in the thing, you don't find the letter where he says the opposite, or his conversation where he says the opposite. That's one of the things to be kept in mind. They did clearly a very great injustice to Oppenheimer with the hearings and so on. This was just a dirty job. You would do many things, but the enemy he hated because he would do this very much. And the enemies were not all without reason. Rhodes: He earned them, didn’t he, some of them. Segrè: A certain number, he earned them. Rhodes: There's a new biography of Lewis Strauss, the first biography of Lewis Strauss, the Atomic Energy Commission chairman. That's coming out next summer I believe. Segrè: I don't know it. Rhodes: I don't know whether it's going to be good or not. Segrè: I know of what he wrote, Strauss. Segrè: I mean, you know, he spoke with God. [Laughter] I didn't like him. Rhodes: May I ask you some questions? Rhodes: Clear up some questions that I've had looking over all of the records. One of the first ones that comes up is, apparently [Enrico] Fermi had trouble at [the University of] Göttingen, that first time that he was there. [Max] Born and [Werner] Heisenberg didn't understand his ability? Segrè: He didn't have real trouble. He remained isolated. He was not recognized. His value was not recognized. But he sat aside at his table and did his work. That's the trouble that he had. Rhodes: Leona [Woods] Marshall mentions him mentioning it to her once, and seeming still very angry about it many years later. Rhodes: They were together at Como [the Lake Como conference in 1927]. They were together at Como, right? 1927? Segrè: Como, yes. Well, at Como, the situation was this. They were about the same age. They knew each other. By then, it was clear that they were all three pretty powerful people in science. Fermi spoke pretty good German. Neither Pauli nor Heisenberg spoke Italian. So it was very natural that they would get together. And they had met. Rhodes: You were there too, weren't you? Segrè: Oh, yeah. But, I was there as a student. They had already met, between Göttingen and Como, they had already met several times. I don't know now precisely where. They were certainly acquainted, and of course Fermi had already published his statistics by the time of Como. It was very clear that he was the most important Italian guy. The Italians at Como, except Fermi and [Franco] Rasetti, none spoke any language. They were pretty old, and didn't come out much. Rhodes: There's another statement that I have a feeling is inaccurate, but that is that Fermi turned in 1934 to working with artificial radioactivity, because the English didn't understand the Beta Decay Theory, Fermi’s Theory. He turned to experimental physics at that point in some disgust. He sent this beta decay paper to Nature, and it was rejected. Segrè: That's true. That's a fact. Rhodes: Is that why he turned to it? No, he turned to it because it was there, right? Segrè: Oh, no. Fermi had always had interest in experimental physics. In fact, even his doctoral thesis was in experimental physics—not published in the collected papers, but it was experimental. Maybe it is. I don't know. Anyway, it was [Italian title]—image formation with axis. It would be in Italian. It was an experimental thesis. He had dabbled with experiment all the time, and by 1934, he was very eager to enter experiments. I mean, he had prepared all kinds—he and Rosetti, and all of us. We had prepared all kinds of instruments, tools. Segrè: He just laughed when that paper was rejected. Rhodes: He knew its quality. Segrè: Oh, yeah. In fact, at the same time, I had sent to Nature the paper on spectroscopy. Mine was accepted, and the one of Fermi was rejected. I use to tell him, “Well, you see, they recognized good papers.” But, there were no hard feelings—except for one thing. At that time, we had put—by we, I mean, [Edoardo] Amaldi, Rasetti, and so on—had put pressure on Fermi to publish in English and not in German anymore because of the Nazis. Fermi, being very conservative, didn't like to change. He had always published. He had a very clear policy. Mediocre papers were published only in Italian; only good papers were published in foreign languages. He had extremely high idea for this. By now, it's fifty years later, there were plenty of very-good papers, which should have been published. But, unless the thing was first-class, they wouldn't publish it in a foreign language. The reason was that he wanted to force the world to take notice of Italian physics, of our group, and so on. He said, “We'll force them because they will see that they had to read these papers.” And so he was very stick to the point. Now, he had published in German his best papers. We put pressure on him to change to English for the reason of the Nazis. He wasn't very enthusiastic about it, but, “Okay, let's change to English.” One of the very first papers—bam—it was rejected. In fact, he published it in German shortly thereafter. If you’ve seen his collective papers, you’ll find it. Rhodes: Dr. [Edward] Teller in a book of his describes the business with Ida Noddack, the German chemist lady. I'll read it to you, maybe that way it’ll make sense. Segrè: There is a fair amount of truth in this. Segrè: Well, let me tell you what I know about this. The paper I know that was right was read and noticed. In Rome, in Berlin, in Paris, I know for sure. Rhodes: You know that they saw the papers? Segrè: Because I asked Hahn, I asked Joliot [Curie] and so on. I know for sure in Europe—I know that in at least three places, it was noticed and read. I'm practically sure, although I didn't ask specifically, whether [Ernest] Rutherford or [Sir James] Chadwick or somebody at Cambridge [University] read it, but I'm practically sure that somebody read it. Fermi, he wrote that the reaction was—that no, it can't split. But I don't know why it was said so. What Teller said there is something that Fermi also told me, but, many years later. Rhodes: That there was an actual calculation. Segrè: That he had made a calculation, and been misled by Aston's numbers. I can't understand exactly how this could have happened. However, Fermi told me the same thing, but many years later. Rhodes: Numbers referring to the binding energy, is that it? Those are the numbers that Aston had worked up. Segrè: What I presume is something of this type: If you put a neutron into—first you give it about an excitation of about six. To produce this splitting, you have to go over a barrier. Once you have passed the barrier, the thing goes. Now what the mass defect has to do with it, I don’t know. I don't believe that at that time Aston's curve for the mass defect would not have given a minimum with the two fragments. I'm practically sure of it. I haven't rechecked on the Aston publication at the time. However, Fermi told me something of this type. What you read me there, is not new to me, and is not very new. I heard Fermi say something like this. But you know, occasionally Fermi would tell you things. When you asked him, “But really how? Show me." And then he would say, “Oh well. I know this with my formidable intuition,” and he would swallow, and he was say, “I know this “con cif,” and he spoke Italian.” What “cif” means is “con intuito formidabile,” “with formidable intuition.” So how he did it, I don't know. On the other hand, Fermi made a lot of calculations, which he kept to himself. He didn't tell anybody. Rhodes: I was especially curious because Szilard was playing around with whether beryllium would produce extra neutrons. About the same time, he seems to have had the same problem with one of Aston's numbers. Segrè: Szilard was a very frank guy. If you had seen them, you would have said for sure that Szilard was a genius, and you would have said for sure that Fermi was a banker or was a postal clerk. Rhodes: You make Fermi come to life very much in your book, you really do. Segrè: But, if you knew them, then you saw the difference. Szilard, without any question, was a genius, in the sense of having many, many new ideas, and tremendous fantasy, and all kinds of things. However, he was quite superficial, and possibly not enough discriminating. I don't know. I was always intrigued by Szilard. I really like him. Fermi didn't like him at all. Rhodes: No? Well, that’s right. Segrè: No, Fermi couldn't stand him. Rhodes: Did that feeling precede their work at Columbia, when they had these problems with building those early [experiments]? Segrè: In part, it was with the work of Columbia. It's a question of character. Fermi liked concrete achievement, not big ideas, but numbers and things where you could put your teeth in. If you made a great scheme of the creation of the universe, even if it had some truth in it, he didn't like it, unless he had numerical substantiation or it could be tested experimentally or something. And Szilard was a man with fantastic schemes. The word association of the scientist, the word garment, the word this, the word that, and so on. That didn't go with him [Fermi]. Also Szilard acted always like wrapping himself in mystery. He was very poor. He didn’t have any money. He wanted to show that he had tremendous financial backing or that he was commanding or could control this and that. And he was bluffing. This was fairly transparent. That wouldn’t go with Fermi at all. Rhodes: Szilard was very Hungarian, if you will. And of course, Szilard then made a mortal sin. He said, “Oh I don't want to work and dirty my hands. I can’t’ be an assistant. I can do better than to work here.” And of course that was something wouldn't go with him [Fermi]. Rhodes: Something else, a very short paragraph that I'd like to read to you. This is from [Rudolf] Peierls' biographical memoir of Heisenberg: "In the summer of 1939, Heisenberg visited the United States again, and lectured in Michigan and Chicago. There many of his old friends and colleagues tried to persuade him to leave Germany because of the impending disaster. To this Fermi added the warning that the recently discovered uranium fission might contain the possibility of military applications, and that in wartime scientists might find themselves working for the government on such schemes." That seems a little unlikely to me. Segrè: It seems to me impossible, not unlikely but impossible! Rhodes: To pass the word to a German scientist. I’m going to see Peierls, I hope this September. I will ask him. Segrè: Where did you find that? Rhodes: That's in the Fellows of the Royal Society Biographical Memoirs by [Nevill Francis] Mott and Peierls, Rudolf Peierls. It’s their biography. Segrè: Yeah, I know Peierls. And that's a biographical memoir of him or of Heisenberg? Segrè: The only thing that I would do if you really want to know, is to ask Peierls whether he knows it for sure. Now I know Fermi told me about his talk with Heisenberg and so on. Rhodes: Did you comment on it? There's no real record of it that I’ve found. Segrè: No, there's no record, but he spoke to me about this. But I can tell you one thing for sure. Fermi was so tight-lipped, that he came in January of 1940 I believe—I can find it—or something like this, here [America]. We worked together. We went on many hikes. We were very old friends and so on and so forth. He never mentioned to me chain reactions or uranium. He would mention peculiarities of fission. But he stayed away. He even said that no one would want to speak about this kind of thing. So that he would go and talk to Heisenberg in 1939 with the situation, it doesn't seem to me possible. Rhodes: That’s why I noticed it and wondered about it. Segrè: However, I don't know. I wasn't there. Rhodes: I will check with Peierls and I'll see. Segrè: Did you check in Heisenberg’s memoirs? Rhodes: I have read some of them. I don't recall anything specific about this business. Segrè: Heisenberg relates his conversation with Fermi in his memoirs. Rhodes: All right, I'll go find it. Segrè: However, he is a very unreliable source. Rhodes: He sort of apologizes and changes. He had that version of his discussion with Bohr too. Segrè: There are two books of Heisenberg. Well there are many books, but several books of Heisenberg [foreign language]. There are all translated also in English, in which he relates the development of quantum mechanics, down crucial episodes of his life, and so on. This conversation is described there; however, it's not reliable. Now, look! This is all to be taken—I'm translating it now. He believed at that time firmly that there was a family of physicists of the whole world. There was such a family of physicists of the whole world, of which he had so often spoken to me. He did not suspect that he excluded himself from this family by remaining in Germany, that he would screw himself. I have to make the translation. I'm just not reading so much. “Since he had never identified with politics, or with the politics of the Nazi, he firmly believed that old friendships could survive above the political antagonism. Fermi, with whom he discussed his decision of remaining in Germany, showed a certain understanding for this decision.” Not true. Although, at the end, he did not agree with him, or he did not—how would you say, Rosa, “nicht billigte”? Rosa Segrè: Say what? “Nicht billigte”? Condone. “Those who were diffident of him believed even that he failed the duty to work with all his forces to a German victory. After all, one knew that Heisenberg was a patriot and that he loved his country. So, what was more natural than to believe that he would hope for the victory of his country? In truth, however, Heisenberg never had a doubt that Germany would lose this bad and criminal war, in fact that it had to lose it,” and so on and so forth, it goes on. Rhodes: I don't have German unfortunately, but you just gave me a very nice piece of it. Segrè: Okay. It may be translated. Rhodes: That's possible. That's true. Elizabeth Heisenberg, then? Instead he has to say, “No, I sabotaged it on purpose.” He never said it, but he had many people say it for him, and he gave all kinds of information trying to form this legend. This is beyond me. Rhodes: Niels Bohr's wife Margrethe Bohr, says in an oral history that she left at the American Institute of Physics, he [Heisenberg] was not really quite honest about a lot of things in her experience. He didn't always quite state the truth. She was referring particularly to the version of his meeting with Niels Bohr that he gave to Robert Jungk, which was questionable too. Segrè: What happened there, I don't know. It is not known, but it is a fact that Heisenberg was like a son for her, for Bohr. And after the story, there was an estrangement. They never got together after the war. Segrè: Well, they met and so on, but the old relationship was not reestablished. Rhodes: Could you tell me about your discovery of the effect of cosmic rays on U-235, and its consequences in the middle of the war, December '43? Rhodes: I'm wondering about my own note now that I ask you. That had a significant effect on the bomb program, did it not? Segrè: It was suspected that this very heavy element could make spontaneous fission, could make fission spontaneously. Of course, that would be important because if you have to make a bomb, and this stuff starts to fission by itself, not when you want, but by itself, obviously, it's a pretty dangerous thing. We tried that with uranium without much success to see this spontaneous fission. The spontaneous fission was discovered by two Russians, [Georgy] Flyorov and [Konstantin] Petrzhak, who even published it. Rhodes: During the war? Before the war? Segrè: I believe before the war or in those years. Anyway, there is no question that Flyorov and Petrzhak are the people who saw this spontaneous fission. In fact, I have even the original, the manuscript. They gave it to me. I have it in Russian. Once it was decided to use plutonium, plutonium is a strong alpha emitter. If it has impurities of light elements, they make neutrons, and produce a pre-detonation of the bomb. So Los Alamos was organized at the beginning with the tremendous chemical effort to purify plutonium from all light elements, to an extent that nobody knows whether it would have been possible or not. But anyway, in the middle of this, precisely in '44. In fact, I can show you. I just got a report on it. My group, [Clyde] Wiegand, [Owen] Chamberlain, I, and that's it. It was one of our assignments in Los Alamos. We investigated spontaneous fission of uranium. And, we found the following thing: that uranium made with a cyclotron. No, I'm sorry. I'm saying uranium, I meant plutonium. Plutonium made with a cyclotron has not much spontaneous fission, but plutonium made with a pile [reactor] has a high spontaneous fission. Now, these things we interpreted. It's very easy to interpret. It is, the real radiation of plutonium-239, that's when you put it into the pile, makes plutonium-240, which has a high spontaneous fission. This was a bomb on the project because it would make impossible to use plutonium to make a bomb. Rhodes: In the gun bomb. Segrè: In the gun. At that time, we knew only of the gun. So, it was really a major upheaval with the whole business, see, because it killed half of the project. Rhodes: Did you find out that spontaneous fission, when a sample of material came from Hanford? Segrè: Well, I can show you. December 3rd of '44. It's a very simple thing to read. It's a couple of pages. We had been studying that for considerable time, it was not the first time, but this is a conclusion. Rhodes: So, you did have material from Hanford then? Rhodes: From the X Pile? Oh, no. That's from the pile that was in Oak Ridge. Segrè: Cyclotron didn't do irradiation long enough. It irradiated only once. It didn’t re-irradiate it, you see. Of course, the more that you irradiated—what happens is, that if you make it with the cyclotron—if you make it with the pile, the plutonium-240 grows quadratically with the square of the flux. So you see, if you make the pile with plenty of flux to produce a lot of plutonium, it goes into the square of plutonium-240, so there's no way around it. There's just absolutely no way around it. Rhodes: When you found this, did you then take it to Oppenheimer? Rhodes: What happened? Was there a great uproar? Rhodes: It wouldn't solve the problem. Segrè: It wouldn’t solve the problem. On the other hand, it killed the possibility of making the bomb with the gun. Rhodes: That was December, then, huh? Yes, September, I see. September 8, 1944. Segrè: That’s the report. Yhe work was probably done a couple of months earlier. Rhodes: That then was the time when the whole laboratory was reorganized to go for an implosion design. Segrè: And, I mean. [Seth] Neddermeyer had proposed this implosion, you see, but nobody had taken it very seriously until the [discovery of high spontaneous fission in plutonium]. But, when this came about, then it became a matter of life and death. Rhodes: It was the only alternative. Segrè: It was a miracle that there was one. Yes. Rhodes: Miracle, that it had been thought of. You were at the Trinity Test. I just re-read your description here. I sensed a feeling that there was even some fear that morning, and just apprehension, if you will. Segrè: I can tell you, I personally, when I saw that thing going on, I said, ‘Well let's hope that they haven't”—I asked and informed myself whether they were absolutely sure that the atmosphere wouldn't catch fire. They assured me what they had done, so, but you know. I mean, they can always make a slip. That thing was pretty fearful. So, I mean, I can’t say that I started to calm down! Rhodes: There's the story about Fermi joking about igniting the atmosphere the night before, upsetting General Groves, or something. Segrè: No, I don’t think—the question of igniting the atmosphere had been taken quite seriously. Rhodes: Yes, and thought through. Segrè: People had calculated all the mass defects, all the packing fractions, and everything that one knew. And making all of the hypotheses, possible hypotheses, came out, and there was no chance of igniting the atmosphere. But I’m enough of a physicist to know that you calculate everything, and then something happens that you never dreamed of. Rhodes: Fission for starters, right? Segrè: Take for instance, when we discovered the slow neutrons. Who would have suspected that slow neutrons were so powerful? A couple questions, if I may, about Fermi after the war that perhaps you have some insight into. You would know of course his minority report to the GAC [General Advisory Committee] about the H-bomb. Segrè: He talked to me about it. Rhodes: Good. Someone is credited—and I'm sorry, I don't remember offhand who—as saying that he rather recanted that later. He said, “Oppenheimer hypnotized us. I would not now, five years later have said that.” Of course this is [Willard] Libby or this is [Edward] Teller. It's one of those. Segrè: Oh, Libby or Teller, oh yeah. No, no. Segrè: First of all it was very, very, very unusual for him to talk about that, talk about that thing. He talked to me about it. Rhodes: Oh, in that sense, I see. Segrè: Fermi wasn't the person to—he was the fairly reserved type. So, it's not true. Rhodes: It doesn't sound like him. Segrè: Look, I mean, Fermi didn't tell his wife that he was making a bomb. I don't mean a bomb, but he made a chain reaction, you see. I think that is true. I mean, that story is true. So Fermi was very very tight-lipped. He wouldn't comment on persons only very rarely, and then very much by understatement and so on. But for Fermi, of course, I can’t tell what he may have told Libby or Teller or thought, but I don't think that it's likely. He certainly didn't tell me anything like that. Rhodes: You said he did say something to you about this? And, this I found later, but what he had told me, without telling me that he had made a memo. He didn't tell me about the report, majority and minority and so on, but he discussed the whole thing. Then, what is in the minority report is not very different from what I remember. I didn't take notes at the time, so I don't know, but I mean, it jives pretty much. Rhodes: The report itself was unusual for him. He didn't normally state moral positions in his writings, did he? Segrè: Yeah, but then it was [Isidor] Rabi who wrote it or formulated it. Rhodes: That's true, they did write it together. Segrè: Rabi had something to do with it. Rabi is a person, although he's not a practicing Jew, or a religious man in the sense of going to the synagogue or not eating pork or anything like this, but he's very much imbued with a biblical, Talmudic lore. I don't think that he could tell you, “Jeremiah chapter so said this.” That he wouldn't know, but he has heard that kind of stuff all of his life. Rhodes: He was from an Orthodox family. Rhodes: One last question then. Someone describes Fermi in his last illness deciding that he must, and this is said as he might have used the words, "saved Teller's soul" on calling him about the H-bomb business, and calling him in and encouraging him to recant about it, I guess. Segrè: No. That, I was directly involved in that. And in fact, I even took notes at the time because I was very upset. I came back from South America. Went there for vacation. The telephone rings, Sam Allison was crying on the phone. “What has happened?” He was barely speaking. He explained to me that they had made an exploratory operation and found maybe so and so. And very few days later, as soon as I could, I was just coming back from South America, and I had to be here kind of at the university, I forget. Never mind. I went there. I found him. I spent about four or five hours with him, the whole afternoon talking. He could talk and so on, but at the end, I came out of the hospital, I couldn’t—it was such an upheaval. I did a thing that I think I probably have done maybe two or three times in my life. I went to bar to have a drink. And then I went to Leona Marshall. It was dinner. At that time, yes, she was already married to Marshall. I had dinner with her, and then I went back to bed. I made notes of the conversation at that time. He said—I wish I had the notes here because I don’t have them. You know that book “The Hydrogen Bomb” that had come out? Segrè: In those days there had been a big scandal in Time, and the adman wanted to buy it all back. Fermi told me, “When you go back, tell Teller to come to see me.” And he said, joking, “What better for a dying man than to try to save his soul? We spoke always in Italian, but that's what he said. He told me many things, part humorous and part serious. That was the whole thing. He would joke about his disease. On the other hand, he knew quite well that he couldn't last, pretty much. He knew what he would do if he lasted for so many weeks, and what he would do if he lasted three months. [He said], “Send Teller to talk to me. Teller has done something very irreparable. He has sinned”—I hate using the word “sin,” but he has done something very bad. I cannot remember now. I would have to translate it from Italian also. Rhodes: This is in reference to the security thing, right? The Oppenheimer hearing? Segrè: No, no. No, this was with reference to this book on the hydrogen bomb, and essentially to have produced a tremendous split in the scientific community, having introduced partisanship in science, and of course, also the Oppenheimer hearing. I do not think he spoke specifically on the Oppenheimer hearing. I cannot remember. I probably would have it in my notes, but I do not have the notes here. I have them at home. Segrè: The outcome of that was that Teller went there. I spoke to him. And then later he told me something, which I do not doubt that Teller heard it that way. It is clearly not what Fermi told me. I do not think Fermi would have changed his mind. Rhodes: [Laughter] We hear what we want to hear. I’m wondering if that paper he wrote, called “The Work of Many People,” was an outgrowth of that meeting. Segrè: Yes, it had some relation with that. It was certainly not the advice of Fermi. Fermi said, “Just disappear.” I do not have any of the various memoirs of Teller. Segrè: Check what he said. He puts in this book also what he told me, as well. He probably wanted to hear that. Rhodes: That is enough of your time. Would you autograph that for me? It has been pleasant to have books with signatures. Segrè: When is your book coming out? Rhodes: I hope to be finished by next spring, in which case, it will be out next year. Segrè: Who is publishing it? Rhodes: Simon and Schuster. I have had a Ford Foundation grant for the last two years, so that I was able to go to Berlin and look at the original Otto Hahn-Lise Meitner correspondence, and go to Hiroshima and Nagasaki. Segrè: How would you look at the Hahn? Rhodes: I simply looked at it. I had a friend translate it for me. I have a little bit of German, but not enough to translate, I am afraid. It was a very moving thing, just to see the documents. Segrè: Did you speak to Bethe? Rhodes: Yes. I spoke to [George] Kistiakowsky before he died. What a marvelous man he was. I am going to see Stan Ulam next week, and I think at point that I’ll stop. I’m so glad I had a chance to see you. Segrè: Have you spoke with Frank Oppenheimer? Rhodes: That is a problem, because I wrote a profile of Oppenheimer a few years ago for American Heritage. I do not think Frank Oppenheimer liked it very much. I have not tried to make contact with him. Perhaps I should. Segrè: What did you write? Rhodes: I thought it was a very favorable attempt at a psychohistory or a biography. It was not entirely favorable. I think that bothered [him]. Segrè: I think that Frank understands his brother to a certain extent. I do not think he is a worshipper. I do not know, but I do not think so. Rhodes: At least he did not like some of the interpretations I made. As I look at it now, it was a rather naïve piece of work. I had not done enough homework to do it as well as I should have. Segrè: Oppenheimer was a complicated person. Rhodes: Of course, the letters had not been published then, which have been enormously helpful. Rhodes: I saw Teller. It was a very painful thirty minutes. He was very angry at me. He had read something I had written and did not like it, and just shouted at me for thirty minutes. On the other hand, it was probably a good insight into Teller. Segrè: Teller thirty years ago was not the way he is now. Rhodes: He was not so paranoid? I know that is an exaggerated word. Segrè: Fermi said—I did not hear Fermi say this—he was quoted by somebody who really heard it firsthand. It was a student of his. He said, “I have never seen a monomaniac with more than one maniac,” speaking of Teller. Rhodes: Teller is a very difficult person to figure out. For one thing, his letters and so forth are not available to look at. One cannot treat them historically. I do not know what to do about Dr. Teller. Segrè: I know Teller quite well. It’s very easy to speak with Teller, if you had come to me. Rhodes: I went directly to him. Segrè: There is a famous letter of Locke, the philosopher to his cousin, who gives him instructions: “If you want to speak to Newton, you have to do so and so and so.” He gives him all the instructions on how to speak to Newton. I do not want to say that Teller is comparable to Newton, but he is a physicist and mathematician. In other ways, he is comparable. If you want to talk to Teller, all what you have to say is, “Well, of course, unfortunately, people do not know it, but you are the greatest physicist of the century. Clearly, Einstein does not compare to you.” A few things like that and he will become quite nice. Rhodes: I think I have published things that he did not like, things about nuclear power and so forth. We did not start out very well. I was going to ask you, in your [inaudible] there is no Edward Teller. His physics – I’ve got someone at home right now, looking at all his papers. I’m very curious about the physics that he’s done. Apparently he’s not in the mainstream. Segrè: No. Teller is a man who has made many, many, many, things, very good ones. He has never made a real big one, of colossal importance. Also he has been deflected from science at a relatively early age. He has become obsessed with bombs, from let’s see, ’30? Teller is now seventy-five. He was born in 1908, correct? Segrè: Probably, from ‘42 on, he has been immersed in politics. Rhodes: Of course, that was another Fermi story. He sat down with Fermi. Fermi said, “Have you thought about a thermonuclear reaction?" Segrè: Now he is getting into trouble, because he has the story of the laser and all this talk, which I do not know how it is going to end. Rhodes: I am writing a story right now for the Atlantic Monthly about his involvement in this Reagan proposal too [Strategic Defense Initiative]. Segrè: Do you have the facts? Rhodes: No. I only have the facts he presented. I am going to be interviewing George Keyworth. I was out at Livermore [National Laboratory] out there talking to them about their works. I am trying to assemble a little bit. Segrè: I believe that it is this. Teller has every interest to show and say that he has influence on Reagan. This gives power to him. Reagan has every interest in saying that Teller does not have influence on him, because Teller has appeared enough on television and is enough of a controversial figure that it does not help Reagan to get votes. Where is the truth? Rhodes: The little bit that I have tracked indicates that Teller may well have been the one to sway Reagan to mention the business at this particular time. It has been ongoing, of course, for a long time. Segrè: Have you investigated at all the relations between the Stanford Hoover Institution and Reagan? Segrè: If you want to be a reporter, an investigative reporter, you have to find out—I really do not know these things, but [W.] Glenn Campbell, Teller, the Hoover Institution, other members—a large number of people in the Reagan entourage come from the Hoover Institution. Rhodes: It is just as possible, Doctor, that Joseph Coors, of the brewing family, who has been financing the high frontier movement in Washington, has good deal of influence on the President from what I have been able to find out so far. The President does not necessarily need a scientist to tell him about these wonderful new inventions, apparently. Segrè: Clearly. Keyworth is almost certainly a creature of Teller. Rhodes: That’s what I understand. Segrè: On the other hand—well, certainly Harold Agnew is a creature of Teller. Rhodes: That’s interesting. Odd that he would have directed Los Alamos, then. Segrè: Norris Bradbury is a black animal for Teller. So is [Stanislaw] Ulam. Rhodes: That is why I want to talk to Ulam. Segrè: In Hungary and Poland. The other connection there one should know about is--you know Fred de Hoffmann? Rhodes: I know the name. I have never met him, but I know who he is. Another creature of Teller’s, I imagine? Segrè: He is Hungarian. He is a creature of Teller. He was a big shot in General Dynamics. That is where Agnew landed. I just do not know all of the things. Nor do I know this guy [Bernie] Katz, although I have heard his name, I cannot remember him, in some other connection, who gave Teller the laser stock [Helionetics Inc.]. Rhodes: I do not know who it is, other than the entrepreneur who put the company together. Teller attempted to explain the letters and there not being any real connection between that company and the defense program. So he says in his advertisement in the Wall Street Journal. What is your feeling about Teller’s interest in these defense systems? The Bethes said they really felt there was a very primitive horror, fear and hostility to Russia that dated all the way back to those childhood years when the Hungarians were [dominated]. Segrè: Let me add an element to that. There is another element, unfortunately. Teller believes that he is God. He wants to prove it. Segrè: If he can destroy the world, then that shows that he is God. I have absolutely no doubt that Teller has some very pathological part of his brain of that type of megalomania. Also, the way he swallows any adulation. He does not have any feeling that people may be playing on him. He swallows any adulation. If you just say anything opposite to what he says, he sunders. He cannot stand any contradiction at all. This is not a normal man, mentally. Rhodes: Especially a scientist. It is very hard to understand the irrational part, when there is also this rational part. Segrè: No, no. Scientists are like any other men. You should see Newton. Rhodes: That is true. That is quite true. Segrè: Did you talk to [Edwin] McMillan? Segrè: Did you talk to [Glenn] Seaborg? Rhodes: Yes. [Eugene] Wigner, [Phillip] Morrison. Not a terribly long list, but most of whom are already so thoroughly documented, that I haven’t felt the need. But I wanted to meet as many as possible. Segrè: Did you talk to [David L.] Anderson? Rhodes: Yes. I spent an hour with him. Segrè: The book of [Bertrand] Goldschmidt, which is now translated in English. Rhodes: Yes, The Atomic Complex? Segrè: It gives very much a French point of view. However, I think it is a good book. It is a book of a man who knows what he is talking about. In reading it, to me, many things I did not know at all, especially in the postwar period. It was an eye opener. Rhodes: Did you do any work with weapons after the war? Rhodes: Was that a deliberate decision on your part? Segrè: No. I didn’t decide not to work with weapons. My profession is to be a physicist, not to be a weaponeer. It is clear that during the war, under those circumstances, you had to help. You could not say, “No, I don’t want to.” After the war, I did not feel—there was no Hitler around. The arms race, I did not like it. I heard too many things that did not make sense, pushing here, pushing there. I returned to be a physicist. Many people returned to physics. Rhodes: But Fermi did not? Segrè: Well, in a very minor way, after the war. He was on the [Atomic Energy Commission’s General] Advisory Committee. Rhodes: He worked on the thermonuclear. He worked on the H-bomb. No? Segrè: He did some calculations, yes. It was very much a side activity, it was not his main interest. The people who really remained in this business in a strong way were Oppenheimer, Teller, Bethe. There is a new generation of people on both sides, the hawks and doves, people like [Richard] Garwin. Rhodes: Which one is he? A dove, right? Segrè: He is a dove, very much so. I would not say an extreme dove. He may even be a converted hawk. Rhodes: It is a particularly technocratic sort of dove. Someone remarked once that he wanted to fix the United States and fix the arms race. Segrè: Did you talk to Herbert York? Rhodes: Yes, I just came from there two days ago. I talked to York. It was an interesting interview. He was someone who had moved from one position to the other. Segrè: Yes. York was my student. Rhodes: He’s got a good book. Segrè: Yes. York was a brilliant person, a first-class man. He came from a rather poor family under restricted circumstances. His father was a very very nice person, but he was a small employee or an aide or something like this. York, Herb, was young. He was a classy guy who got hypnotized by power, money and pleasantries. [Ernest] Lawrence gave him a concoction of all these items and persuaded him to abandon a brilliant scientific future, to go into weaponeering. I told Herb, “Don’t do it, don’t do it, don’t do it, because you are not going to like it for many reasons.” He was scientifically really quite good. Ultimately, he went into that and he ended after many many years, to come all the way around. Rhodes: I had thought his social background might well have had something to do with this change. Physicists tend to be from professional backgrounds, if you look at the studies that have been done. Segrè: He is probably one of the humblest origins that I can think of, also [Glenn] Seaborg. Seaborg’s brother is a truck driver. But probably York was poorer. Rhodes: His father was a messenger for the Railway Express Company. Segrè: I do not know what it was. Rhodes: That is what he mentioned. Segrè: That is what he was? He was a very small fry in the labor. I know that. York, remarkably so, has learned a lot of things outside of physics, history, politics, and literature. In this sense, he is a much more civilized person than many of the scientists. Rhodes: Interesting. He was rather impatient with some of my questions. Segrè: I do not know, what did you ask? Rhodes: Some of my more psychological questions. Segrè: Well, psychological questions—I do not like psychological questions because there is really no way of knowing what a person thinks. Rhodes: But you were willing to discuss Teller, for example, within the range of being psychological. Segrè: What I am thinking of is to say “This cannot have happened because—” what we are doing, incidentally. I do not like it because there is no way of checking. Segrè: In other words, to distinguish between what is your guess and where it is documented. Rhodes: It is always a very delicate business. Of course, it has to be. What I am not doing is what so many of the books on the subject have done, is any dialogue, putting words in people’s mouths and putting quotes around it. Segrè: Yes. Laura Fermi’s book is very—there is plenty of dialogue there. It is dialogue that, even if it is not taken with a recorder, I can certainly see that scene. Segrè: It is really firsthand stuff. They started at the Mason and Dixon line. Who were Mason and Dixon? I do not know what they meant. Rhodes: There is a story about Fermi burying his Nobel medal in the backyard in Leonia, New Jersey, is that apocryphal? Rhodes: I suppose that was a sensible thing to do at the time. Segrè: No, I do not know about the Nobel medal, but they made a hole in the ground and put some money in there. That is a fact. He told me so. I do not know. Rhodes: There must have been a sense of gratitude toward the United States on the part of all of you. In the sense that it could be unusual that you came here and then so quickly became involved in war work, and helping fight, among other countries, your own country. There is a little of that. Really, the whole affair there, from [inaudible] onwards to a large extent started. That is something that, of course, Rabi would not like to hear. Segrè: Fermi would not say it. It is true. Rhodes: There is a sort of revisionist movement. You know, McGeorge Bundy would like us to believe that the Einstein Letter did not get things started. Segrè: No, the Einstein Letter did not get it started. Rhodes: I understand it was a meeting with Vannevar Bush and FDR. He’s doing this official government version, which is true, technically, but not the Einstein Letter? Do you feel that it had any influence at all? Rhodes: Fermi and the Navy. Segrè: Yes. I cannot remember the name of the person. Segrè: Who wrote it down pretty clearly, I think. If you want to establish a route to the government connection, I would put it more there than in the Einstein Letter. Einstein is a very dramatic thing. It is something concocted by Szilard, Szilard’s idea. It helped. Did you see that unbelievable thing? Who is the guy who wrote Eleanor? Rhodes: Joseph Lash? Eleanor and Franklin? Segrè: Yes, Eleanor and Franklin. Lash? Rhodes: Was it Lash? I am not sure if it was Lash? Yes, Lash. No. What unbelievable thing? Rhodes: In the book Eleanor and Franklin? Segrè: Yes, which must be true because it came out indirectly from Germany, of somebody passing, in a very unbelievable way, information to Chicago and from Chicago, on the German project, to Eleanor Roosevelt, who concocted a meeting of this unknown guy, I do not remember the name, it’s given there but somebody I had never heard of. She went to the president and gave him all information, which was fairly reliable, on the German project. Rhodes: I will have to look at that. That is interesting. I did not see that. I thought you were going to mention the young Chicago scientist who arranged to see Eleanor about his feelings about using the bomb. That was a later event. Segrè: That was probably later. But look it up, this thing with Lash. It is something really out of a movie or a television show of not very high quality. Rhodes: It’s reliable, you think? Later, he told me, “We have heard that this is mentioned in a book.” I went to look around a little. I found this book, and lo and behold, it jives very much from what came from the German side. It must be true. Segrè: No, I’m not saying it’s true with Einstein. Rhodes: I understand that you are talking about a later event. I am just thinking that it was apparently Egon Bretscher who passed that information to Einstein, as far as I can remember. Segrè: I do not know anything. The information must have come to Szilard. Rhodes: You said Einstein did not know. Now I understand. Yes, right. Segrè: Szilard must have gone with a letter written, or just about. Rhodes: There were two drafts, as a matter of fact. Segrè: There were two drafts? Segrè: I did not know that. Rhodes: I spent a lot of time poking around Szilard’s papers. Segrè: Do you know the girl who has made a thesis on Szilard? Rhodes: His brother-in-law mentioned her and gave me her name, and the name of the thesis. I have not looked it up. Segrè: It is pretty good. Rhodes: Is it? All right. Rhodes: Based on the papers? Segrè: Based on the papers and on information from Gertrud [Szilard]. Rhodes: Oh, that would be useful. Segrè: At least it is something worth looking at, if you are working on that kind of thing. As a historian, I would look at the thesis. She has spent a lot of time and so on. Also, she has gone through [General Leslie] Groves’s papers. Groves just could not stand Szilard. Rhodes: I know. I just spent a week at the National Archives going through Groves’s top-secret papers about the Manhattan Project. There are FBI surveillance reports of Szilard. They are very funny. They say things like, “Seems to spend a lot of time with people of Jewish extraction. Seems to like delicatessens.” Whoever was writing it, this poor FBI person, did not understand who he was following. It is very amusing. Segrè: You should see the file of the Italian secret police on Fermi. It contains unbelievable things. It says that he was on the payroll of [inaudible] because he had found a way of making synthetic art. Rhodes: Egon Weiss, Gertrud’s brother, gave me her name and where she is located. Rhodes: Are you working on any other writings about all this? Segrè: Not about all this, no. That has been written so much. There are so many theses in the history of science on this story. Did you see the one, Scientists in Power? Rhodes: That is a good job. It’s Spencer Weart. Segrè: Yes, it is a good job. It is a good job for me, because I am pretty well informed on the whole thing. It would be an extremely poor job for a person who is not informed. If you see that, you see absolutely only the French angle. Rhodes: Yes, to be sure. Segrè: You acquire a completely lopsided and wrong idea of the importance of the French work. Rhodes: I took it as a footnote, but a well-documented footnote. Segrè: It is extremely well documented. You learn a lot of things. I learned a lot of things out of it. I even suggested to have it translated or something. It is a story, very well done, of the detail of the whole picture. Rhodes: Rather biased for a historian, a professional historian. He rather champions the French point of view. Rhodes: He does emphasize, quite frequently, that this happened here first, rather than there. He does, in that essence, champion the French. He wants to be sure everyone understands that they did the chain reaction studies or whatever, before they were done in New York. Segrè: Yes. That’s all baloney. That is all wrong. Joliot at a certain moment, says, “I have made a chain reaction." Everyone says, “Yes, it is a convergent chain reaction. It does not diverge." All you have to do is—if you have a pot of uranium salt, you a convergent chain reaction all the time! That is the kind of stuff, I would say, stuff of this type, Fermi couldn’t stand. He would become rather angry. That is also why he did not like the Szilard patents and all that kind of stuff, when you try to grasp more than you really can, you try to claim things which you haven’t done or have no right to claim, or something. Rhodes: Because for Fermi, it needed to be quantified? Segrè: A chain reaction has to work! Before you claim a chain reaction, you have to have a chain reaction. Rhodes: Yet the idea itself has some value. Segrè: No. It is a trivial idea. Everybody has it. Rhodes: Did everyone have it in 1933? Rhodes: When Szilard first thought of it? Segrè: At that time, he did not have the idea of a chain reaction. He said, “You put everything into a bottle and maybe something happens.” That is not an idea. The idea of the chain reaction started after this discovery of fission. You make fission and you have some more neutral form. Of course, if you are using nuclear you have a chain reaction. That idea came to twenty persons, probably more. I do not know how many. I can tell you for sure that Joliot had it. Niels [Bohr] had it. I had it. Fermi had it. I am sure [Edoardo] Amaldi had it. [Franco] Rasetti, in all likelihood. Szilard, I have not the slightest doubt. Anybody who knew a little of the subject could see it. It was a pretty obvious thing. [Otto] Frisch [had it]! Rhodes: The idea that Szilard had it much earlier, do you don’t think really qualifies as an idea for a chain reaction? There was an idea of multiplying neutrons. It was not in the right material. I think he tried beryllium. Segrè: No, because it would not have worked. Rhodes: And in fact, it did not work. He talked about uranium. In fact, apparently he even talked to Fermi about uranium. This idea that one could make a chain reaction, Joliot patents. Then he thought he could control the whole world with patents, which were very clearly and very justly invalid. Because a patent must tell you how to do a thing. If it just tells you, “Put together uranium and heavy water,” that is not sufficient. Rhodes: I am sorry, I do not remember. I suppose it was one of your books. Segrè: Well obviously if you know it somehow, you must have read it. Rhodes: I have it on file, I don’t know where though. I said, “I am going to go back to Palermo, be a professor." Indeed, that is what happened, and I remained at Berkeley. Rhodes: Did you have possessions that you were unable to retrieve? Had you essentially already moved to the United States? Rhodes: Was that painful, that decision? Segrè: It was not painful. Rhodes: Is it a silly question? Segrè: To me, at least, the painful things are when you have to decide and have great uncertainties. Is it better to go to Brookhaven or to go to Berkeley, or to go to Chicago? Here, there was nothing to decide. Rhodes: It really was not a choice. How often do madmen appear in history? We had Hitler. We had Nero. We had Genghis Khan, who was perhaps [inaudible], or somebody like that. I think every few centuries. Rhodes: Yes. He quantified it again, didn’t he? Rhodes: He seems to have had an absolute mania for quantifying everything. I don’t mean that as a bad thing. Segrè: What else did you write, besides the Donner Party? Rhodes: Three other novels, which probably did not find their way to California. I have written a very large number of magazine articles over the last twenty years, on all sorts of subjects, everything from coyote hunting in Kansas to thermonuclear fusion research. Making my living that way for a long time. Segrè: What are the novels? Rhodes: The Ungodly was the first. That was the Donner novel. The second novel was called Holy Secrets. It was about a gynecologist, fictional. One called Sons of Earth. That was the one I wrote two years ago, which is about an astronaut whose son is kidnapped as the result of his fame as an astronaut, and buried alive. He has to find him. It’s sort of one of those stories. The Donner story got the point of almost being a television miniseries. Reason prevailed and they realized that television audiences were not terribly interested in cannibalism. So that did not happen. I have a couple collections of essays that I have written over the years, but no full-length nonfiction books. This is the first. I love it. It is wonderful. Segrè: What are the essays, on what? Rhodes: The first book I published was about the American Midwest, where I live. The essays were all about that place. There was one on Truman and one on Eisenhower, looking at them as people who are psychologically [Midwestern]. Segrè: Where did you live? Rhodes: I live in Kansas City, Missouri. Still do. Segrè: The place of Harry Truman? Rhodes: Yes, right. I used to go to church half a block from his house and see him when he was president, so that all fit in. The more recent book of essays has the piece on Oppenheimer and others like him. That is the one that Dr. Teller did not like. Rhodes: I wish I did. I have an electronic typewriter, which is close. All of the notes for this book I have had to put on those little cards with the holes. Segrè: You should learn how to use a word processor. Rhodes: I would be glad to. It is just a question of buying one. They are very expensive. That is my next plan. Segrè: They are tax deductible. Rhodes: I have two children in college this year. Rhodes: Yes, I remember, people said he sounded like [Oliver] Cromwell when Scottish armies came over the hill, “The Lord hath delivered them into my hands.” He was delighted with Pearl Harbor.